Intended to help improve measurement and data collection methods in the behavioral, social, and medical sciences, this book demonstrates an expanded and accessible use of Generalizability Theory (G theory). G theory conceptually models the way in which the reliability of measurement is ascertained. Sources of score variation are identified as potential contributors to measurement error and taken into account accordingly. The authors demonstrate the powerful potential of G theory by showing how to improve the quality of any kind of measurement, regardless of the discipline. 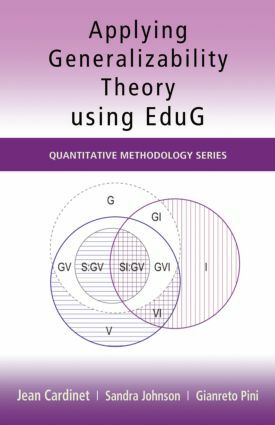 Readers will appreciate the conversational style used to present a comprehensive review of G theory and its application using the freeware EduG. To maximize understanding the authors illustrate all fundamental principles with concrete examples from different fields and contexts. Annotated applications lead students through the main concepts of G theory, while illustrating both the use of EduG and interpretation of its output. Formulas are avoided wherever possible. Exercises with data sets available on the Psychology Press website allow readers to carry out their own analyses to reinforce understanding. Brief overviews of analysis of variance, estimation, and the statistical error model are provided for review. The procedures involved in carrying out a generalizability study using EduG follow, as well as guidance in the interpretation of results. Real-world applications of G theory to the assessment of depression, managerial ability, attitudes, and writing and mathematical skills are then presented. Next, annotated exercises provide an opportunity for readers to use EduG and interpret its results. The book concludes with a review of the development of G theory and possible new directions of application. Finally, for those with a strong statistical background, the appendixes provide the formulas used by EduG. Ideal as a supplement for courses on measurement theory and/or generalizability theory taught in departments of psychology, education, medicine, and the social sciences, this text will also appeal to researchers from a variety of fields interested in learning how to apply G theory to their studies. : What is generalizability theory?